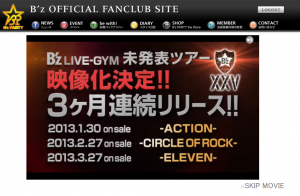 B’z To Release Three LIVE-GYM Home Videos Next Year! The first news of the B’z 25th anniversary year is here, and… it’s BIG! In typical B’z fashion, the celebration is being kicked off in a huge way! Beginning January 30th, the band will be releasing not one, not two, but THREE previously unreleased LIVE-GYMs on home video in the span of only three months! The news came down on B’z PARTY (the official B’z fanclub in Japan) this morning and you won’t have to wait long! 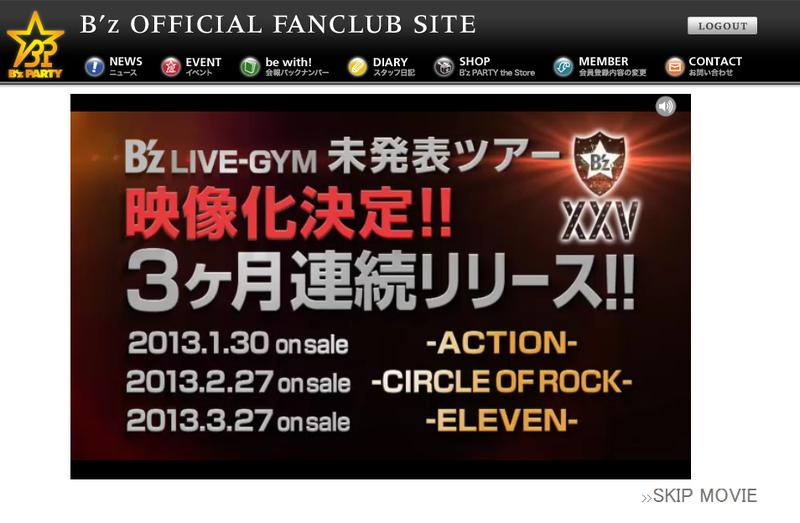 For the first time ever,B’z LIVE-GYM 2008 “ACTION” will be seeing its home video debut, while—finally—we will be able to see the full shows of LIVE-GYM 2005 “CIRCLE OF ROCK” and LIVE-GYM 2001 “ELEVEN” (previously highlighted on compilation discs released over the years). ACTION will be coming in January, with the other two to follow in February and March respectively. What is perhaps most noteworthy about these releases is the fact that so many of the songs being released are coming to home video in live form for the very first time. The 2008 single “BURN -Fumetsu no Face-” will make its live debut on the ACTION release, along with album songs “Junjou ACTION” and “Perfect Life”, plus prized B-side “New Message” (among many others). The 2008 tour was especially exciting for fans for—at the time—offering one of the best balanced setlists the band had put together and should be a fantastic watch when it hits DVD & Blu-ray on January 30th. All releases will cost you 6,300 Yen. There is no additional content. Set lists after the break! A ☆ denotes a song making its home video debut. Finally…. *_* But 85$ each. I am a sad panda. I’m so happy and I’m looking forward for this but yes, for me the DVDs will cost each one 61 euro. It’s a little bit expensive but I think that it’s worth… maybe. Great news. Hope they release their early live-gyms and all of their PVs someday. Aren’t “GOLD” and “X” making their home video debut as well? “GOLD” is on the bonus DVD that comes with “B’z The Best ULTRA PLEASURE”. While a performance of “X” can be seen on the live stream version of “B’z live in Nanba”, it is indeed making its home video debut. Oh, right, I forgot about the “ULTRA PLEASURE” bonus DVD. I’m really happy for this news (my bank account not XD), but I’m bit disappointed because just Action will be on Bluray. This news made my day!!!! ALL of these tours have great setlists which tour nowadays lack (Magic tour’s setlist is good too though!) So wish they would release LOOSE tour too as that setlist is pretty good also! So gonna grab all of them.